During the 2007 election campaign, the Democratic Labour Party promised to introduce Integrity Legislation and a Freedom of Information Act within 100 days of taking office. They put that in writing in Pathways to Progress, in press handouts and in newsletters and emails. The DLP also promised to introduce a Ministerial Code of Conduct immediately upon taking office. They put that in writing too. David Thompson lied about it. Freundel Stuart lied about it. Every DLP candidate lied about it. You can say that the electorate was naive or ready to believe the DLP lies about Integrity Legislation because after 14 years of BLP corruption we were desperate. You can say the electorate was ready to be deceived, but it doesn’t matter. We believed the DLP. We truly did. We had faith in the DLP candidates as people. We elected the DLP candidates and leadership because we believed their promises. We believed IN the DLP candidates as people of their word. 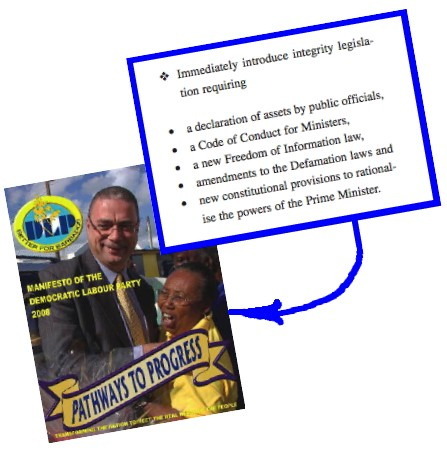 The DLP promises about what we called “ITAL” – Integrity, Transparency and Accountability Legislation – were a big part of why Bajans elected a DLP government. That much was admitted at the time in the news media and in comments from foreign observers. It has been over four years since those promises were made, and three years and seven months since the DLP Government took office and immediately broke their first promise by not implementing a Ministerial Code of Conduct on the first day. Now we read in The Nation “The Barbados Private Sector Association (BPSA) wants Government to move quickly to redraft the Prevention of Corruption Bill, 2010 and get it back on the front burner” within six months. A DLP insider reveals how David Thompson and his gang intend to sabotage Integrity Legislation and Freedom of Information laws by expanding the promised laws to include private citizens and corporations. We also said that the DLP would delay the Integrity Legislation until just before the next election, so they could blame the BLP opposition for shooting it down or delaying it. That way the DLP would get to use Integrity Legislation for two election campaigns in a row while retaining all the benefits of not having the legislation in place while they are in government. A neat trick if they can pull it off. It looks like we were correct. That’s unfortunate because we would rather have been proven wrong. It’s also unfortunate that the only politician who told the truth about the Integrity Legislation and Freedom of Information was the Barbados Labour Party’s William Duguid, who was quoted on another blog saying that Integrity Legislation will never happen because no politicians of any party will ever vote for it. 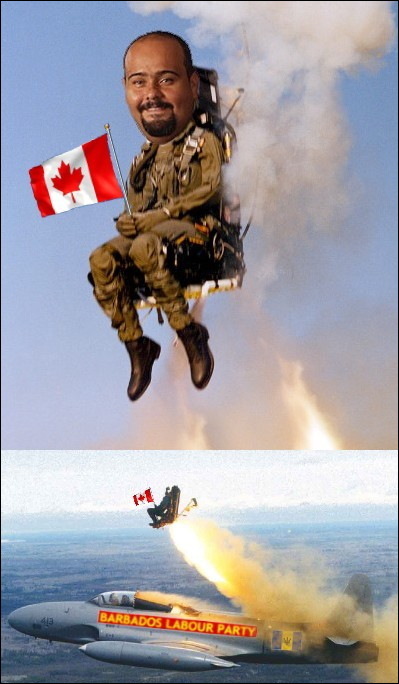 Duguid is moving to Canada so it doesn’t matter to him anymore if he speaks the truth. Here’s the thing, folks… We can’t profitably grow sugar cane for any purpose, whether for foreign or domestic sale, for food products or fuel. We used to do it, but the world changed and we can’t do it now. We’ve shown we can no longer do it. On the BBC 26th August. The number one growing problem in the world, is fast becoming one of Food. There seems to be a little staggering towards this realization in Barbados, at last, that something must be done with agriculture in a big way. There are those of us who have been constantly screaming about it, but our voices are now hoarse, and age has taken away our insistence. But ”One day, one day, Congotay. 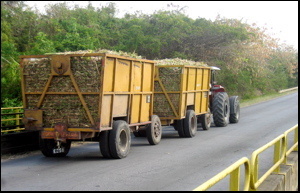 That’s what the old people say.” Will the true revival of Barbadian agriculture come too late? Will we really ever start eating our own grown and raised food again, where we have control of what pesticides and what forms of fertilizers we use ? There are so many great farmers, all over the world, suffering war, and drought, and all forms of persecution, and here we have land, going to useless waste, with good rainfall, and mostly mild conditions, and we have to import 90% of our food requirements. What utter fools, fools, fools we are.